SC DS ONE RealTime Game Guid. Player can Switch between Game Guide display and game playing. Page up/down support. Game Guide support Chinese, English, Japanese and Korean. It's a very useful function, player can play game and view the game guide at any time. How to make RealTime Game Guide? A: It's very simple. Just download the Game Guide from internet, and save it as a .txt file. Use cht2supercardcheat.exe convert .txt to .csb. How to convert .txt to .scb? A: 1. Run cht2supercardcheat.exe. 2. Click "Make Book" button. 3. Select the .txt you want to convert. A:There are two methods: 1. If the ROM in the database. You can rename *.scb to the ROM series nunber, and put the *.scb to scshell\book. 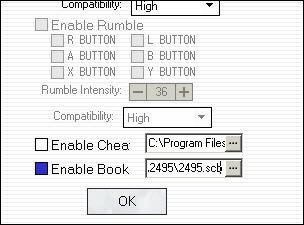 Example: If you have a ROM "0061 - Bomberman (U)" which in the patch database, you can rename the .scb file to 0061.scb and put it into scschell\book folder. 2. If there is a new ROM not in the database, You should rename the *.scb file name to match the ROM name. And put the ROM and *.scb in the same folder. Example: If you hava a ROM "2351 - Nanatsuiro Drops DS-Touch" which is not in the patch database, you can rename the *.scb file to "2351 - Nanatsuiro Drops DS-Touch.scb", and put it with the ROM file together. With the slot2 carts you will have to use the PC patching software to patch the .scb file to your rom. Load your rom into you PC patcher then right click your rom to bring up your properties menu click enable book then navigate to your .scb file then patch as normal. To download premade walkthroughts click the scb link! !